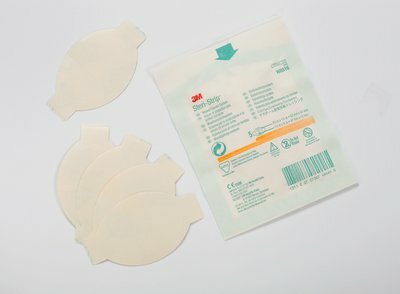 Dressing size 2-3/8 inch x 1-7/8 inch, Strip size 1-7/8 inch x 1/2 inch, 5 closures and dressings envelope. Translucent nonwoven material that contain latex. Comes in a case of 100. Provides a viral and bacterial barrier while keeping wounds protected, secure, and allows patient to shower or bathe. Non-invasive design helps reduce scarring and the risk of infection as compared to sutures and staples, providing less tissue trauma and better cosmetic outcomes. May be worn up to 7 days and reduces the likelihood of skin irritation.